It just takes repetition for new habits to become ingrained ones. That seems logical, but heck, in 2018, logic is not what it used to be (let’s save this tangent for an offline rant). For this week’s (actually it is last weeks I think) 9x9x25 I am sharing my own effort to be as diligent as I can in including alt descriptions in my online use of images. There’s part of it that is just the right thing to do, something that really does not expend much effort. But I will also clue you in that it gives some pause and some thought to what you are conveying in an image. I got a bit fueled up for this in June as I learned about a lot of PR made about twitter including the ability to add alt descriptions to text, that would make twitter content more clear to people with impaired vision). Still twitter does not make it easy. As a user of twitter you need to opt in among a series of almost hidden settings to turn on the functionality to edit image descriptions. This alone, I bet, by not making accessibility features on the default, means that 99% of twitter users will never even be able to do it. But why would they listen to me. So I have been doing my best to add descriptions to tweeted images, on my mobile device, and when using tweetdeck on the laptop. I’ve also been taking care to add them when uploading images to blog posts. It’s not about describing the image in inordinate details, but as I understand, what it takes to replace the content in an image with suitable, brief text. As I have done this, I sometimes find it’s okay to leave a blank alt="" tag if my writing already explains something, e.g. if it’s not essential to understanding to replace the image, just filling with repetitive task must me a huge annoyance to anyone accessing the web view a screen reader. alt="App list for a newly installed TRU Writer site, arrow pointing to login link"
It’s hard to know how well I am describing these. WebAim provides instructions for OS X users to turn on Voiceover features where you can experience the web as someone w/o good eyesight (I assume there are ways for people with other OSes to find a way, that’s your googling to do). I challenge you to learn the commands (all keyboard) and try it for an hour. Or five minutes. I struggled much to get the hang, well it took maybe 45 minutes, but I still flailed at getting the cursor to move to next elements. Just for fun, I went through my own tweets, and here are two in a row that include image descriptions I entered in Tweetdeck. Then see if they conveyed what was in them. A week after I heard about it all over social media, @flickr finally tells me, because they "are required to" a fee paying flickr Pro member, that terms are changing. But here are things I am missing doing. When my blog tweets a new blog post, the image it is using (via open graph tags) are not coming through with alt descriptions. I guess it’s okay as they are not strictly necessary? But I notice that for images I uploaded as a featured image, I have not been adding the alt text (BAD COGDOG). So I have done it with the image on this one as a test to see of the alt text goes with it. Yet, thinking about the replacement of information, I am unsure if featured images that show up as twitter card images really need replacement. Thoughts? I generally insert my featured images, with full credit, and alt descriptions if needed, at the bottom of my posts. And as I have found, others too, that even with twitter’s added functionality, they do not apply to animated GIFS. So no reaction gifs for the visually impaired. It’s unbelievable challenging to navigate the web by voice reader only. Maybe it’s worth doing a challenge to put on opaque glasses and try it for an extended period of time. Maybe if the powers that be did it in twitter, they might make image descriptions a featured just turned on. I challenge them to explain to anyone, why it is not. There are the links if really curious. Twitter, you can do better easy. 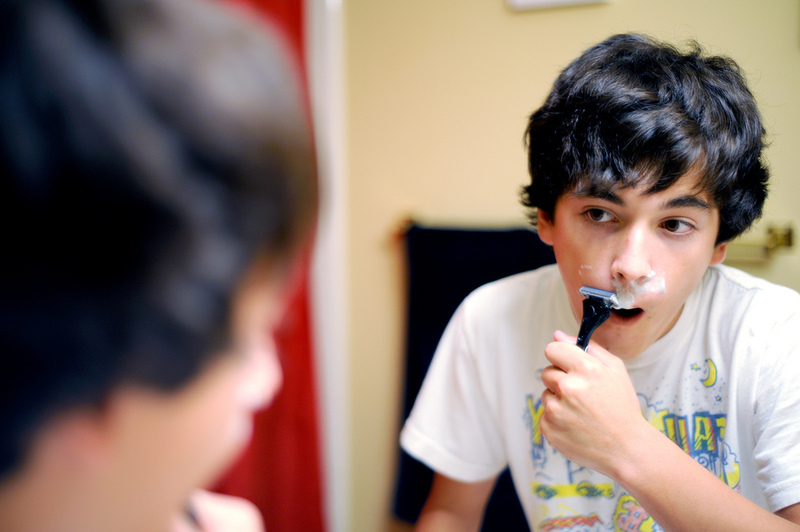 A youngish teen boy watches in the mirror as he shaves for the first time. A description of what is in the image (not a caption). If the page specifies an og:image it should specify og:image:alt. I’m submitting a message to the Jetpack support forums. Wish me luck. What we actually need is software that can take an image as an input and write a reasonably accurate description of it as an output. That’s probably a lot easier to do than to convince everyone to write alt descriptions. You have more faith in machines than I.
I think it would be easier to write the ALT tags. I can’t even get another human being to agree with me on what they see in my photos. Thank you for this post! I am one of those people who always remind people to alt text their pictures and I will put the voice over on my phone to make sure people have added alt text and then tell them if they haven’t. I follow a bot on twitter called @PleaseCaption that reminds you when you have forgotten your alt text, it’s pretty great. Thanks for being part of the ALT force ;-) And as well for sharing @PleaseCaption though I think it serves people who are already aware. And it’s newest tweet was in May 2017 so wonder if it’s alive. Ooooh, ALT force I like that! Yes I think it still works, at least it did when I messed up a few months ago on a tweet. Hmm … I do my best to add ALT tags to my images but only when there are one or two images in my posts. In a post with several images (e.g. https://islandinthenet.com/seneca-lake-day-one-grist-iron-two-goats/), the cognitive burden of choosing useful captions is an impediment to posting. Trying is better than not trying! I do not see it as a need to caption or ALT describe all images. The way I think about it is, if someone can only read my content, what do they need to make full understanding of the concept? It’s not about describing each image, it’s more about what can take their place, if they are essential.